The temperature is -3 on its way to -18 and I have to apologize to everyone because the cold is my fault. 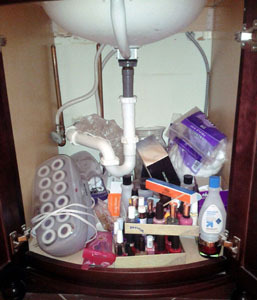 You see, I’ve been putting off organizing the cabinet under my bathroom sink for months. It’s easy to pretend the mess isn’t there when it’s hidden. And, it’s so easy to hide: just close the door and it’s gone! Outa sight. Outa mind. Life is good. Until the temps hover below zero for days on end, and the cabinet doors have to stay open so the pipes on the exterior walls don’t freeze. UGH! There it is, staring at me, daring me to dig deep. What will I uncover? Garish lipsticks, old eye shadow, and duplicate purchases because I forgot what was in there. Bottles of nail polish used just once. Waste and disorder. It shouldn’t surprise me that God is going to this length to get me to clean, purge and organize the impulse purchases and hidden mistakes in my cabinet. He goes to even greater lengths to get me to look deep into my heart and purge the mistakes (sins) that are hidden there. God does this. He reveals hidden sin so that I might confess, purge, repent and be cleansed. God causes me to look at the hidden sin in my heart because sin is a barrier that separates me from intimacy with God and God wants a relationship that is free of barriers. God knows the deepest darkest caverns of your heart and mine. He knows the impulse purchases we try to forget. He knows the garish mistakes. He knows the reality of what is hidden there. We may try to hide our sins, but nothing is hidden from God. God won’t let us hide. He loves us and wants us cleansed. We may try to close the door and pretend the mess isn’t there, but God won’t let the door stay closed. He allows circumstances or events in our lives that force us to open the door and confront the reality of sin. When we acknowledge the mess, confess, and repent, God’s cleansing light of forgiveness floods every deep corner of our hearts. God cornered me. He does frequently, and when He does, I cleanse, purge and organize. My heart is good and my cabinet is too. You can expect the temps to start rising any moment! Amber will be so proud of you! Haha. Thanks for this wonderful and pertinent message. How practical and much needed. Love you! It always starts with just a little mess. And the Lord waits while we hesitate and putz along. He will wait and walk beside us till the end of time. All we need to say is Lord I have another mess in my life. Sound familiar? Now I know who to blame for this horrible weather!!! LOL I loved this!! 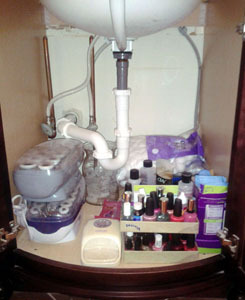 One issue is people can more easily see messy closets, cabinets, drawers, etc and finally start cleaning them. However, some people say “I don’t know why I cleaned it out as I ended up putting everything back in!! But when it comes to the mess in our hearts, we have trouble admitting and seeing that! We have to keep our lives close to God and ask for guidance in what we need. Sometimes we purge out what we need to but turn around and put some back in!!!!! I repeat—I loved your post!!! love this practical application! OH my!!! Hit me hard this morning as I know there is a cabinet like this I need to attend to. 🙂 I am so grateful for God’s stubborn love that continues to corner me too and help me to purge my heart of what does not belong! Love this post Marcia! Thank you!!! “Garish mistakes” —that phrase particularly resonates with me. Love it and particularly love that I am washed clean by God’s cleansing light. Whew! great blog today reminds me of my Reconciliation talk. Our priest made a statement that struck me and certainly “totally” applied to me….Admitting sin is an act of honesty and courage. It is an act of entrusting ourselves beyond the sin to the mercy of a loving and forgiving God. Two sets of electric curlers???? ?